I don’t know about you, but for me the summers flash by like a bullet train. Every year, as the caboose of the summer train passes, I stand scratching my head, trying to figure out why life goes by so fast. It is true: time waits for no one. The passing summer signals not only the end of float trips, baseball games and summer shenanigans but also time for the administrative side of parenting. Having never grown-up myself, this can be a challenge. I can never recall what needs to be done to get my son ready for the upcoming school year. Typically, this involves a call to my mom who patiently walks me through it. But this year, I took advantage of our new pediatrician, Dr. Ameera Nauman, and asked her to make a checklist of to-dos that will help me him excel this school year. For certain grades, your child is required to get a school physical. You can call your family doctor or pediatrician. With insurance, the copay is usually between $25 and $35, and the appointment takes around 30 minutes. If your child is going to play sports, they are required to have a sports physical. Like a school physical, your family doctor or urgent care can perform the physical for about the same copay. You should also consider a concussion baseline measurement. Concussions should be taken seriously. A baseline reading can help health care providers determine if your child has suffered a concussion and how best to treat it. It is important (and required) for your child to be protected from communicable diseases. Vaccines offer the best defense against many serious illnesses. Most insurance plans are required to cover recommended vaccines without charging you. If you don’t have insurance, the government has numerous resources available to get your child immunized. If your child has a medical issues or special needs, you should inform school nurses and teachers so they can be prepared to care for your child’s needs. In some instances, the school may require certain documentation or permission to assist your child. Take this time to verify your emergency contact information is up-to-date. Poor sleep can put your child at a huge disadvantage in class. Have your child go to bed at a consistent time in a calm, quiet sleep environment and try to limit their pre-bed screen time. Depending on their age, your child should get 10 hours of sleep a night, a little more for younger children and a little less as they age. Emotional and mental health are just as important as physical health. A new class or school can cause your child to experience anxiety and stress, both of which can wreak havoc on school work and physical health. Have an open conversation about the upcoming school year. Let your child know not only what to expect but also what is expected of them. Anxiety and stress can be alleviated when you know what to expect from a situation. There are thousands of healthy recipe ideas on the internet. Making lunches does not have to be another chore. Use this opportunity to search for lunch ideas with your child’s participation. It is an excellent opportunity to learn about your child’s likes and dislikes and to teach them about healthy eating and how that can help them feel and be their best. Strong knowledge and practice of good nutrition will help both you and your child make straight A’s! Not all kids play sports, however, it is important for all children to stay physically active. Kids still need to get 150 minutes of moderate to intense physical activity a week- about 30-60 minutes per day (depending on the child’s age). School schedules and events can make it difficult for them to get the necessary exercise they need – plan fun activities that double as exercise. Computers and tablets are taking over for the thick textbooks, but kids can still have several pounds of books to lug around every day. 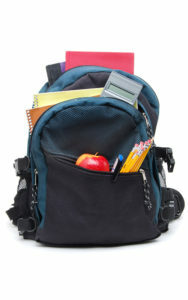 Find a high-quality backpack that fits them properly, bottom should be around four inches from their waistline, and will distribute the weight evenly to their shoulders. You can also consider a rolling bag if it works for your child. A couple of pieces of reflective tape on the back can help keep your child safe when walking to and from the bus. There is Dr. Nauman’s best advice for prepping your child for the upcoming school year. And, yes, they are mom approved. David Pruitt is a writer for the Marketing & Communications division of OSF HealthCare. He has a bachelor’s of journalism from Southern Illinois University Edwardsville and worked as a reporter before joining OSF HealthCare in 2014. An avid golfer and fisherman, David was born and raised Alton, Illinois, which is where he currently resides with his son, James. When should your child see a therapist?